Since we launched spreadsheet forms in January, one of the top user questions has been "How can I embed my form into a website or blog?" Last night, we added this option. You'll see this new feature during form creation, when you're prompted to invite people to fill out your form. Just skip the invitation step and look for "Embed" in the upper right-hand corner of the page. Paste the code provided into your blog or website. 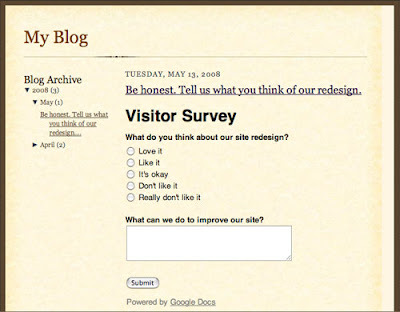 Here's what a form looks like once it's been embedded into a blog.